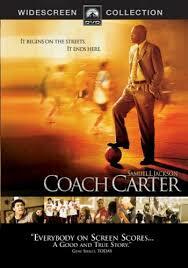 Main Title: Coach Carter [videorecording] / MTV Music Television Films ; Paramount Pictures presents an MTV Films production ; a Tollin/Robbins production ; a Thomas Carter film ; produced by Brian Robbins and Mike Tollin ; produced by David Gale ; written by Mark Schwahn and John Gatins ; directed by Thomas Carter. Local Call No: VCD GV 884 C37 C37. Credits: Director of photography, Sharone Meir ; editor, Peter Berger ; music, Trevor Rabin ; costume designer, Debrae Little ; production designer, Carlos Barbosa ; special effects, Martin Bresin. Summary: Inspired by a true story, this inspirational account of a high school basketball coach who received high praise, and staunch criticism, for benching his entire undefeated team due to their poor academic performances. Subject: Carter, Ken -- Drama. Subject: African American basketball coaches -- California -- Los Angeles -- Drama. Subject: Basketball coaches -- Drama. Subject: Basketball players -- California -- Los Angeles -- Drama. Subject: High school athletes -- Conduct of life -- Drama. Subject: Motivation in education -- Drama. 2 video discs in 1 can (VCD) (ca. 136 min.) : sd., col. ; 4 3/4 in. ©2005, 2005, Paramount Pictures , Hollywood, Calif.